Excellent condition and they sound great. This item is black. Connect Play:3 speaker wirelessly to any Amazon Echo or Alexa-enabled device, then just ask for the music you love. Wirelessly Stream favorite music services like Amazon Music, Pandora, Apple Music, and Spotify. Sonos PLAY:3 Black Wireless Speaker - Amazing Sound! Even if you’re not an all-out audiophile, you still deserve great sound. There’s also a bass radiator to pump out the lows. Stand it tall or set it on its side. Either way, Play:3 automatically optimizes the sound. Condition is Used. Speaker works great. No dents or scratches. Sound is amazing. Sonos PLAY:3 Wireless Streaming Speaker In Black — Used, Excellent Condition Packed in original box. With AC cord. Sonos PLAY:3 Wireless Speakers. Condition is New. Shipped with USPS Priority Mail. Wirelessly Stream all your favorite music services like Amazon Music, Pandora, Apple Music, and Spotify. Connect your Play:3 to any Amazon Echo or Alexa-enabled device, then just ask for the music you love. Excellent condition and they sound great. T his is a great compact speaker that gives big sound. This speaker is currently hooked up to my WiFi and works wonderfully. No major scratches or blemish, excellent condition. Sonos Play:3 Play 3 Wireless Multi-Room Speaker - Black. Condition is Used. Shipped with USPS Priority Mail. Comes as shown. Condition: Used Works great! Fast free shipping! Delivers richer and deeper sound than Play:1, making it perfect for spots where you have more room. Connect your Play:3 to any Amazon Echo or Alexa-enabled device, then just ask for the music you love. Play different songs in different rooms at the same time. Or, pump one song in perfect sync, throughout your home. Set-up in five minutes using your home Wi-Fi. Easily expand your home audio system over time by adding wireless speakers to additional rooms whenever you’re ready. Wirelessly Stream all your favorite music services like Amazon Music, Pandora, Apple Music, and Spotify. LED indicates Sonos component status and mute status. Three Class-D digital amplifiers perfectly tuned to match the three dedicated speaker drivers and the acoustic architecture. One tweeter creates a crisp and clear high-frequency response. Used in excellent working condition. No cosmetic issues either. A bass radiator produces powerful low notes while two mid-range drivers and one tweeter fills out the sound. Cords are 6.5 feet long. . The Sonos Play:5 Wireless Music System brings you the ultimate listening experience with the purest deepest most vibrant sound. Apple AirPlay music sources: Connect an Apple AirPlay music source such as an Apple AirPort Expres to any Sonos player with line-in. Sonos PLAY:3 Wireless Smart Speaker - Black - PLAY3US1BLK. MPN: PLAY3US1BLK. Our main warehouse is located right outside of Baltimore, Maryland. No accessories included. Smart Phones. Smart Watches. Sonos Play:3 Wireless Speaker, Black, Model #PLAY3US1BLK. Connect Sonos to an Amazon Echo or Dot, then simply request the music you love. Who am I kidding?. I prefer cash. If you don't know what an APO is, then it doesn't apply to you. Brand New Authentic Sonos Play 3. Condition is New. Speaker color is white. Shipped with USPS Priority Mail. 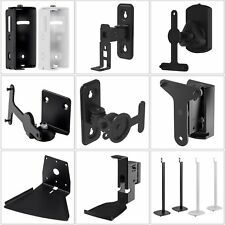 Fixed Wall Mount for SONOS PLAY:3 Speakers: Wall Mount for SONOS Speaker, Swivels and positions easily for optimal listening experience. Toolless tilt allows for effortless positoning, Keyhole pattern allows for easy installation. Cable management keeps everything organized. Connect your Play:1 to any Echo or Alexa-enabled device, then just ask for the music you love. - Local pick up is not available. - If you receive an item and it doesn't work properly or you don't like it because of any reason at all. Fits Sonos ONE, PLAY:1 and PLAY:3 wireless speakers. Compatible with the Sonos PLAY:3 in either vertical or horizontal orientation. Anodized aluminum stand construction provides both durability and style.